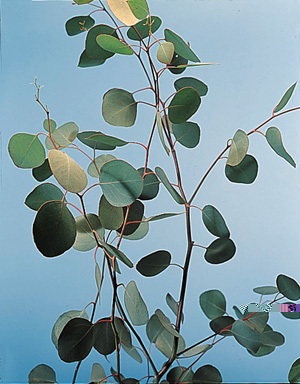 Home|Floral Library|Silver Dollar – Eucalyptus polyanthemos, E. spp. Decorative Life: 20 plus days. Plant pruning can greatly influence production and quality of harvested branches. This species is fast growing and can normally recover rapidly from being exposed to too low growing temperatures. Common relatives include bottlebrush, myrtle and tea-tree. Leaves are circular, 1-2 inches in diameter. Plant is a broadleaf evergreen tree, classed as a dicotyledon, leaves not parallel veined. Leaves have an aromatic, medicinal, or lemon-like fragrance. Depending on species and cultivar, some recommend up to 35 days at 33-35F dry or about 7 days wet. Others show that they can be stored wet or dry at 41F for up to 5 weeks. Scientific name is from the Greek words “eu” (well) and “kalypto” (to cover), referring to how the calyx forms a cap over the flower bud. The specific epithet name polyanthemos means many flowers. The childhood song, “Kookaburra sits in the old gum tree,” refers to Australia”s signature tree, the Eucalyptus. Well-known for its medicinal properties, oil extracted from the Eucalyptus” leaves is used to cure various ailments, from intestinal problems to insect bites. Minor dermatitis can occur due to frequent handling. Can be used fresh or dried and is sometimes dyed and preserved with glycerin. Flowers or seed pods sometimes included with foliage. This family is important economically for many edible fruits including guava, rose-apple, spices such as allspice and cloves, timber (eucalyptus) and many ornamental species. Dubois and Joyce (1992) presented the following tips when preserving this species with glycerol: pre-wilt the foliage for 12 hours at 68F; adding potassium or sodium chloride to the 30% glycerol improved uptake; varying pH from 2 to 8 had no effect and various germicides did not improve the process.